Talking about money in any situation is tough. Talking about paying bills or spending money on large purchases will always be hard. The same is true for you, isn’t it? Talking about your own services, your art that you do for a living is really tough. It’s true. If this describes you right now, you’re not alone. Hundreds of thousands of photographers across the nation struggle with how to value their work. They don’t want to charge too much but charging too little wastes time and resources. There are three helpful tips given by veteran photographers that will help each of you narrow down at least a few factors to consider when choosing and planning a pricing structure for your work. First, there is the task of communicating your value, then the difficult and never-ending chase to track and target your ideal audience, and finally ensuring that you are valuing your own time and being ultra-proactive with your planning strategies. Let’s be honest here, clients don’t really care what camera you use or all of its complicated features, they don’t care if you use Lightroom or Photoshop, and they don’t care about the incredible amount of time and effort that you spend tweaking photos, parts of your website, and your marketing strategies that all add up to the payment you need to get by. So how can we communicate our value to people without actually telling them about the time and effort we put into our work? Well, we start by making everything about them. That’s the only thing they are worried about. What they will gain from this interaction. They want to know how much time you will spend with them, what you will provide for them, what you will give or offer to them, and what they will physically receive from you. That’s it. Changing your pitch from why you need the money and why you deserve the money, to how you can give them value is one of the best ways to measure how much you should be charging and how to approach a conversation of that sort. Tell about your value and how much time you want to spend with them capturing their special moments. Tell them about how much time you will put into the few thousand photos you take to edit them to be perfect. Tell them that you are going to work hard to make sure you don’t miss a single moment of their special day- no matter what it is. That’s what clients want to hear. How you will help them. And when you breach the conversation with this angle, they will understand your value in accordance to their needs and wishes. In a perfect world, only the perfect clients would come and use your business services. The ones who are willing to pay for quality, have a great time, and make lasting friendships. However, this isn’t the case and we often have to seek out our ideal clients. Every business has a goal and target market, this is also true for photographers depending a lot on niche, expertise, area, and more. We would love to make everyone happy and we would love if everyone thought we were the best at what we do but that simply isn’t true. Finding your ideal clients is a long, hard journey and you will often experience some clients that make you want to pull your hair out. In the beginning, you snag what you can. Finding good clients can feel like needles in a haystack but once you find a few, you can start to determine who they are, where they are, and how to get them. Think back to one of the best clients you have had. Where did they find you? Online? Word of mouth? Somewhere else? Then ask yourself, based on where that client found you, how you can maximize the exposure in that area. For example, if you are one of the best newborn photographers in town, a great place to hang a flyer or post a sign might be near or around a school. Track where your ideal clients go, where they shop, where they hang out with their friends and more. It might seem a little creepy and you might feel like a stalker, but truth is, you are looking for a specific type of client in a word filled with clients that are less than ideal. Your perfect customer is out there and you just need to narrow your search and hone in on where they are and how to them. Yes, it’s true. So many photographers ignore this very rule because they are too busy trying to please and serve other people. 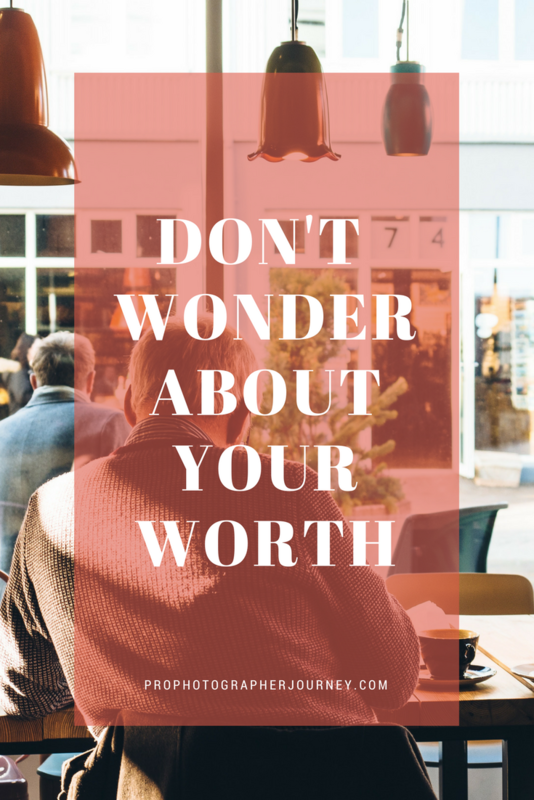 It’s quite difficult to ask someone else to value your time and to pay you a certain amount of money for your services if you don’t even value your time or capitalize on your services. You can still be a perfectly good and happy photographer without actually valuing your business but your business probably won’t last long. As artists, we crave rejuvenation, inspiration, and perspiration. These three can be a deadly combination without balance. You might be ultra-inspired and not be able to actually produce anything and you might be giving a lot of perspiration and not seeing any of the benefits as well. Balance is key. Once you start valuing your time, focusing on your goals, your vision, your clients, your products and many other things you will create a well-rounded and long-lasting business model. In the end, it comes down to you. You are the eyes, the ears, and the mouth of your business and, most importantly, you are the heart and the mind too. You have to take on all of these roles and be sure to keep all of your business senses sharp and keen so you can always be looking for ways to grow and improve. Taking these lesson in how to communicate your value, seek out your idea clients, and start valuing your own time and resources are three ways that will help any photographer refocus their goals in a way that is profitable and passion-filled.